Typical Limiting Values of Sub Station Electrical Equipments. A) Leakage current 500 M-Amp. (Resistive) Hitachi, Japan Recom. B) IR value 1000 M-Ohm. (Min.) Hitachi, Japan Recom. Tan Delta at 20 Deg. C = Tan Delta at Temp T Deg. C / Factor K.
Note: Dew point of SF6 gas varies with pressure at which measurement is carried out. So it is to be ensured that if measurement is done at pressure other than atmospheric pressure, it needs to be converted to the atmospheric pressure. Lightning can create voltage surges in several of the following ways. Lightning can score a direct hit on your house. It can strike the overhead power line which enters your house, or a main power line that is blocks away from your home. Lightning can strike branch circuitry wiring in the walls of your house. Lightning can strike an object near your home such as a tree or the ground itself and cause a surge. Voltage surges can be created by cloud to cloud lightning near your home. A highly charged cloud which passes over your home can also induce a voltage surge. Voltage surges can also be caused by standard on and off switching activities of large electric motors or pieces of equipment. These surges can be created by a neighbor, or by a business or manufacturing facility some distance from your house. These surges are insidious and for the most part are silent. They can occur with little or no warning. The method of providing maximum protection for equipment is quite simple. Create a pathway for the voltage surge (electricity) to get to and into the ground outside your house as quickly as possible. This is not, in most cases, a difficult task. The second step in household surge protection is to install a lightning arrester inside of your electric service panel. These devices can be extremely effective in intercepting large voltage surges which travel in the electric power lines. These devices capture the voltage surges and ‘bleed’ them off to the grounding wire which we just spoke of. If for some reason you do not have a large enough grounding wire, or enough ground rods, the arrester cannot do its job. It must be able to send the surge quickly to the ground outside of your house. Almost every manufacturer of circuit breakers makes one to fit inside their panel. They can be installed by a homeowner who is experienced in dealing with high voltage panels. If you do not have this capability, have an experienced electrician install it for you. Switching surge: The over voltages produced on the power system due to switching are known as switching surge. Insulation failure: The most common case of insulation failure in a power system is the grounding of conductors (i.e. insulation failure between line and earth) which may cause overvoltage in the system. Arcing ground: The phenomenon of intermittent arc taking place in line to ground fault of a 3phase system with consequent production of transients is known as arcing ground. Resonance: It occurs in an electrical system when inductive reactance of the circuit becomes equal to capacitive reactance. under resonance , the impedance of the circuit is equal to resistance of the circuit and the p.f is unity. The traveling waves produced due to lightning will shatter the insulators. If the traveling waves hit the windings of a transformer or generator it may cause considerable damage. The power station & sub-station can be protected against direct lightning strokes by providing earthing screens. On occurrence of direct stroke on the station ,screen provides a low resistance path by which lightning surges are conducted to ground. It does not provide protection against the traveling waves which may reach the equipments in the station. It is the most effective way of providing protection to transmission lines against direct lightning strokes. It provides damping effect on any disturbance traveling along the lines as it acts as a short-circuited secondary. The earthing screen and ground wires fail to provide protection against traveling waves. The lightning arrester provides protection against surges. Type 2 surge protectors are designed to be installed at the beginning of the installation, in the main switchboard, or close to sensitive terminals, on installations without LPS (lightning rods). These protectors are tested following the Class II test from IEC61643-11 based on 8/20 μs impulse current injection. The surge protection selection must be done following the local electrical code requirements (i.e. : minimum rating for In) and specific conditions (i.e. : high lightning density). (ii) On the occurrence of over voltage, the air insulation across the gap breaks down and an arc is formed providing a low resistance path for the surge to the ground. In this way, the excess charge on the line due to the surge is harmlessly conducted through the arrester to the ground instead of being sent back over the line. (iii) It is worthwhile to mention the function of non-linear resistor in the operation of arrester. As the gap sparks over due to over voltage, the arc would be a short-circuit on the power system and may cause power-follow current in the arrester. Since the characteristic of the resistor is to offer low resistance to high voltage (or current), it gives the effect of short-circuit. After the surge is over, the resistor offers high resistance to make the gap non-conducting. It is a very simple type of diverter and consists of two 1.5 cm rods, which are bent at right angles with a gap in between as shown in Fig. One rod is connected to the line circuit and the other rod is connected to earth. The distance between gap and insulator (i.e. distance P) must not be less than one third of the gap length so that the arc may not reach the insulator and damage it. Generally, the gap length is so adjusted that breakdown should occur at 80% of spark-voltage in order to avoid cascading of very steep wave fronts across the insulators. (i) After the surge is over, the arc in the gap is maintained by the normal supply voltage, leading to short-circuit on the system. (ii) The rods may melt or get damaged due to excessive heat produced by the arc. (iii) The climatic conditions (e.g. rain, humidity, temperature etc.) affect the performance of rod gap arrester. (iv) The polarity of the f the surge also affects the performance of this arrester. 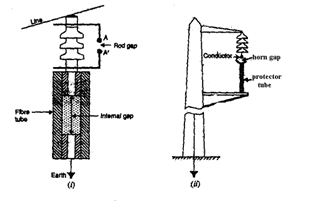 Fig shows the horn gap arrester. It consists of a horn shaped metal rods A and B separated by a small air gap. The horns are so constructed that distance between them gradually increases towards the top as shown. The horns are mounted on porcelain insulators. One end of horn is connected to the line through a resistance and choke coil L while the other end is effectively grounded. Hence the surge is over, the arcs B to C go out and any power current following the surge is limited by the two resistances (shunt resistance and series resistance) which are now in series. The current is too small to maintain the arcs in the gaps A to B and normal conditions are restored. Such arresters can be employed where system voltage does not exceed 33kV. It essentially consists of a rod gap AA’ in series with a second gap enclosed within the fiber tube. The gap in the fiber tube is formed by two electrodes. The upper electrode is connected to rod gap and the lower electrode to the earth. One expulsion arrester is placed under each line conductor. 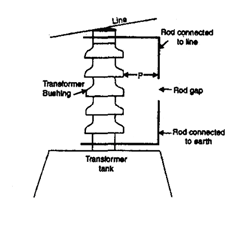 Fig shows the installation of expulsion arrester on an overhead line. On the occurrence of an over voltage on the line, the series gap AA’ spanned and an arc is stuck between the electrodes in the tube. The heat of the arc vaporizes some of the fiber of tube walls resulting in the production of neutral gas. In an extremely short time, the gas builds up high pressure and is expelled through the lower electrode, which is hollow. As the gas leaves the tube violently it carries away ionized air around the arc. This de ionizing effect is generally so strong that the arc goes out at a current zero and will not be re-established. (i) They are not very expensive. (iii)They can be easily installed. (i)An expulsion type arrester can perform only limited number of operations as during each operation some of the fiber material is used up. (ii) This type of arrester cannot be mounted on enclosed equipment due to discharge of gases during operation. Under normal conditions, the normal system voltage is insufficient to cause the break down of air gap assembly. On the occurrence of an over voltage, the breakdown of the series spark gap takes place and the surge current is conducted to earth via the non-linear resistors. Since the magnitude of surge current is very large, the non-linear elements will offer a very low resistance to the passage of surge. The result is that the surge will rapidly go to earth instead of being sent back over the line. When the surge is over, the non-linear resistors assume high resistance to stop the flow of current. When lightning strikes or a transient voltage occurs on the system, there is a sudden rise in voltage and current. The silicon carbide resistance breaks down allowing the current to be conducted to ground. After the surge has passed, the resistance of the silicon carbide blocks increases allowing normal operation. The metal oxide arresters are without gaps, unlike the SIC arrester. This “gap-less” design eliminates the high heat associated with the arcing discharges. In the present scenario of power utilization and consumption, the importance of power quality is vital for a continuous and effective power supply. The features of power quality play a major role in the effective power utilization along with the control & improvement measures for various factors affecting it. 2. It should be of sufficient reliability so that the operator of end-use equipment will be continuous. In other words it may be defined as the concept of powering, grounding and protecting electric equipment in a manner that is suitable to the operation of that equipment. Power Quality has been a problem since the conception of electricity, but only over the last 2 decades has it gotten considerable attention with the introduction of large numbers of computers & microprocessors in business and homes; and the network revolution and ever increasing equipment capability and speed. There are various factors that really make us think about it. 1. Power quality problems can cause equipment malfunctions, excessive wear or premature, failure of equipment, increased costs, increased maintenance, repair time and expense & outside consultant expense. 2. Electronic equipments are more sensitive to minor fluctuations. We rely on the equipment more and have higher expectations. New electronic devices are more sensitive than the equipment being replaced as well. Due to substantial increase of non-linear loads such as the use of power electronics circuits and devices, the ac power system suffers from harmonic problems. In general, we may classify sources of harmonics into three categories i.e. A harmonic is “a sinusoidal component of a periodic wave or quantity having a frequency i.e. an integral multiple of fundamental frequency”. Pure or clean power is referred as those without harmonics. But this only exists in laboratories. The frequencies of the harmonics are different, depending on the fundamental frequency. Due to high harmonic voltage and/or current levels, there are a number of equipments that can have miss operation or failures. 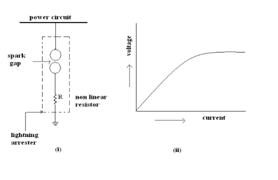 The main sources of harmonic current are the phase angle controlled rectifiers and inverters. Although the applied voltage to a transformer is sinusoidal, the magnetization current related to the flux through the lamination magnetization curve is non-sinusoidal. These harmonics have their maximum effect during the first hours of the day (when the system is lightly loaded and the voltage is higher). Transients occur in Distribution System due to factors like Lightning, Switching Operations, and Fault Clearing/Breaker Operations etc. The various causes of transients in Customer System are Lightning, Arcing Devices, Starting & Stopping Motors, Breaker Operations, and Capacitor Switching etc. In Sags, Voltage falls below 90% of normal but stays above 10% of normal for any amount of time. In Swells, Voltage rises above 110% of normal but below 180% of normal for any amount of time. If it’s long enough, you notice lights dimming or getting brighter. Sags are much more common than swells. Interruptions may be defined as the interrupts that hampers the normal flow of voltage or power quality. When Voltage falls below 10% of normal circuit voltage for any length of time the power supply is off. The outages can be of microseconds to hours or days. When interruptions occur there is a chance of blinking as well. Several techniques are adopted to minimize harmonic effects like increasing pulse number, passive filters and active filters. By use of these techniques we get higher pulse, trap the harmonics and convert the non-linear ac line current into a sinusoidal wave respectively. Power quality analysis is really a matter of concern as it is quite evident how important supply of power is especially in organizations where critical loads need continuous supply of clean power and that too without any disruption. Technological advancements are developing in this sector in order to manage the advanced and sophisticated power systems with utmost proficiency. We can use power enhancers like Surge Suppressors, Lightning Protection/Arrestors, Power Conditioning, Line Reactors/Chokes etc. Power Synthesizers such as Standby Power Systems, UPS & Motor Generator Set can be utilized. Simplest, least expensive way to condition power by clamping voltage when it exceeds a certain level and sending it away from the equipment it protects. Transient voltage surge suppressors (TVSS) can be installed at the terminals of the sensitive electronic loads. Power line filters limit noise and transients to a safe level by slowing down the rate of change of these problems and keeping electronic systems safer than surge protectors can. Use of Power Enhancers like Reduced Voltage Starters on large offending motors, Voltage Regulators, Constant Voltage Transformers (CVTs), Power Conditioners; as well as Power Synthesizers like UPS, Motor-Generator Sets can minimize voltage fluctuations. Voltage Regulators can be utilized to maintain voltage output within a desired limit or tolerance regardless how much input voltage varies. They can also be utilized for protection against swells or noise and limited protection from fast voltage changes depending upon the response time of the regulator. Voltage regulators respond best to slow changes in voltage. Constant Voltage Transformers (CVT’s), also known as Ferro resonant transformers are used for sags, swells, longer term over and under-voltages, especially attractive for constant, low-power loads like electronic controllers (PLC’s) where they provide ride-through capability. Variable loads, especially those with high inrush currents, (Drives) present more of a problem for CVT’s. A long transmission line draws a substantial quantity of charging current. If such a line is open circuited or very lightly loaded at the receiving end, Receiving end voltage being greater than sending end voltage in a transmission line is known as Ferranti effect. All electrical loads are inductive in nature and hence they consume lot of reactive power from the transmission lines. Hence there is voltage drop in the lines. Capacitors which supply reactive power are connected parallel to the transmission lines at the receiving end so as to compensate the reactive power consumed by the inductive loads. As the inductive load increases more of the capacitors are connected parallel via electronic switching. Thus reactive power consumed by inductive loads is supplied by the capacitors thereby reducing the consumption of reactive power from transmission line. However when the inductive loads are switched off the capacitors may still be in ON condition. The reactive power supplied by the capacitors adds on to the transmission lines due to the absence of inductance. As a result voltage at the receiving end or consumer end increases and is more than the voltage at the supply end. This is known as Ferranti effect. Why does voltage rise on a long, unloaded transmission line? The Ferranti Effect occurs when current drawn by the distributed capacitance of the transmission line itself is greater than the current associated with the load at the receiving end of the line. Therefore, the Ferranti effect tends to be a bigger problem on lightly loaded lines, and especially on underground cable circuits where the shunt capacitance is greater than with a corresponding overhead line. This effect is due to the voltage drop across the line inductance (due to charging current) being in phase with the sending end voltages. As this voltage drop affects the sending end voltage, the receiving end voltage becomes greater. The Ferranti Effect will be more pronounced the longer the line and the higher the voltage applied. The Ferranti Effect is not a problem with lines that are loaded because line capacitive effect is constant independent of load, while inductance will vary with load. As inductive load is added, the VAR generated by the line capacitance is consumed by the load. The need for large shunt reactors appeared when long power transmission lines for system voltage 220 kV & higher were built. The characteristic parameters of a line are the series inductance (due to the magnetic field around the conductors) & the shunt capacitance (due to the electrostatic field to earth). In this situation, the capacitance to earth draws a current through the line, which may be capacitive. When a capacitive current flows through the line inductance there will be a voltage rise along the line. 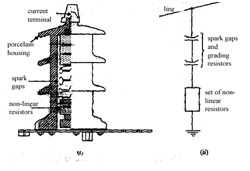 To stabilize the line voltage the line inductance can be compensated by means of series capacitors and the line capacitance to earth by shunt reactors. Series capacitors are placed at different places along the line while shunt reactors are often installed in the stations at the ends of line. In this way, the voltage difference between the ends of the line is reduced both in amplitude and in phase angle. Shunt reactors may also be connected to the power system at junctures where several lines meet or to tertiary windings of transformers. Transmission cables have much higher capacitance to earth than overhead lines. Long submarine cables for system voltages of 100 KV and more need shunt reactors. The same goes for large urban networks to prevent excessive voltage rise when a high load suddenly falls out due to a failure. Shunt reactors contain the same components as power transformers, like windings, core, tank, bushings and insulating oil and are suitable for manufacturing in transformer factories. The main difference is the reactor core limbs, which have non-magnetic gaps inserted between packets of core steel. 3-phase reactors can also be made. These may have 3- or -5-limbed cores. In a 3-limbed core there is strong magnetic coupling between the three phases, while in a 5-limbed core the phases are magnetically independent due to the enclosing magnetic frame formed by the two yokes and the two unwound side-limbs. The neutral of shunt reactor may be directly earthed, earthed through an Earthing-reactor or unearthed. When the reactor neutral is directly earthed, the winding are normally designed with graded insulation in the earthed end. The main terminal is at the middle of the limb height, & the winding consists of two parallel-connected halves, one below & one above the main terminal. The insulation distance to the yokes can then be made relatively small. Sometimes a small extra winding for local electricity supply is inserted between the main winding & yoke. When energized the gaps are exposed to large pulsation compressive forced with a frequency of twice the frequency of the system voltage. The peak value of these forces may easily amount to 106 N/m2 (100 ton /m2). For this reason the design of the core must be very solid, & the modulus of elasticity of the non-magnetic (& non-metallic) material used in gaps must be high (small compression) in order to avoid large vibration amplitudes with high sound level consequently. The material in the gaps must also be stable to avoid escalating vibration amplitudes in the end. Testing of reactors requires capacitive power in the test field equal to the nominal power of the reactor while a transformer can be tested with a reactive power equal to 10 – 20% of the transformer power rating by feeding the transformer with nominal current in short –circuit condition. 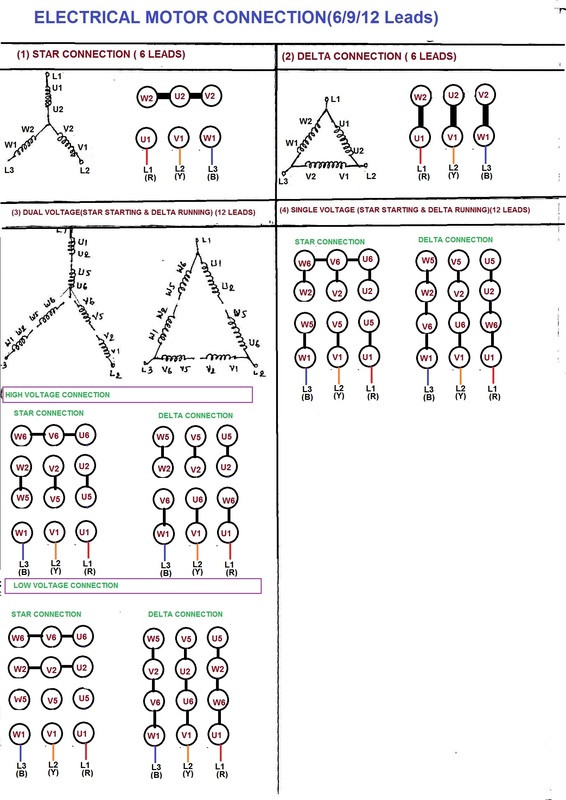 The loss in the various parts of the reactor (12R, iron loss & additional loss) cannot be separated by measurement. It is thus preferable, in order to avoid corrections to reference temperature, to perform the loss measurement when the average temperature of the winding is practically equal to the reference temperature. How does a phase shifting transformer help operators load and unload transmission lines? Power Flow = (Vs*Vr / X) * Sine of the Power Angle. In other words: power flow (in watts) between two buses will be equal to the voltage on the sending bus multiplied by the voltage on the receiving bus divided by the line reactance, multiplied by the sine of the power angle between the two buses. This leaves grid operators with at least two options for making a path more conducive to power flow, or if desired, making a path look less conducive to power flow. The two options are to (1) adjust line reactance and (2) adjust power angle. The Phase Shifting Transformer (PST) affects the second option, i.e. adjusting power angle. The physical appearance of the PST device is noteworthy, being one of the few transformer types where the physical height and construction of the primary bushings is the same as the secondary bushings. This makes sense since both bushing sets are at the same potential. Internally, the primary voltage of a PST is bussed directly to the secondary bushings, with one important addition. The primary voltage is applied to a delta-wound transformer primary that has adjustable taps that inject “opposing phase” signals. For instance the A-B primary winding has a C phase injection, the B-C winding is injected with A, and the C-A winding is injected with B. These injection points are simultaneously adjustable taps that result in an adjustable shift of power angle. Why is this important? Many transmission paths naturally have less impedance by virtue of their construction and length, and these paths can carry scheduled flow as well as unscheduled flow from parallel (but higher impedance) paths. In some cases these low impedance paths become congested and PST devices and other devices and techniques may be used to relieve the congestion. This is particularly the case in regions where transmission paths are less densely developed.